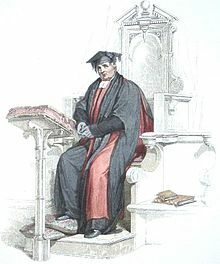 Aquatint of a Doctor of Divinity at the University of Oxford, in the scarlet and black academic robes corresponding to his position. From Rudolph Ackermann's History of Oxford, 1814. ↑ William Whitaker. "William Whitaker's Words - Doctor". University of Notre Dame. สืบค้นเมื่อ 21 April 2011. ↑ Catholic Encyclopedia – Doctors of the Church. Newadvent.org. Retrieved on 2011-12-17. หน้านี้แก้ไขล่าสุดเมื่อวันที่ 24 มกราคม 2561 เวลา 15:56 น.